After declining unit-shipment volumes in 2017, global TV shipments are forecast to grow 3.6 percent year over year in 2018, with additional 1.4 percent growth in 2019, according to a new report from business information provider IHS Markit (Nasdaq: INFO). Of the 226 million TVs expected to ship in 2019, more than half will be ultra-high-definition (UHD) models, the majority of which are 4K. However, 8K TVs from major global TV brands will launch toward the end of 2018, kicking off the next wave of resolution transition, the report says. Technologies like 8K, organic light-emitting diode (OLED) and quantum dot (QD) carry substantial premiums, and even 4K TVs still carry premiums of more than 35 percent at screen sizes where 1080p resolution is still an option, such as 40-inch to 49-inch TVs. 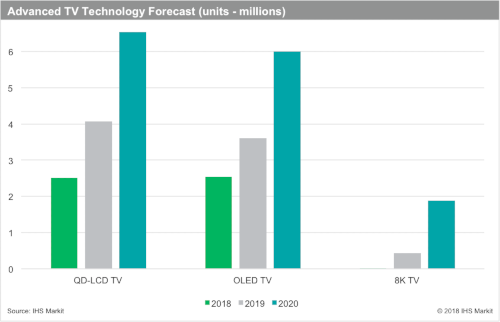 OLED TV is expected to grow more than 40 percent in 2019, rising to 3.6 million units. This growth is in line with previous forecasts, because demand is essentially matching industry production capacity. The size mix still favors 55-inch TVs, based on current prices, but it will transition to mostly 65-inch TVs by 2020, when new production capacity is optimized for larger screen sizes, and when substantial growth is expected in the OLED TV category. The IHS Markit TV Sets Intelligence Service includes detailed information on TV shipments by region, technology, size and resolution, for nearly 60 brands. The report also includes rolling 16-quarter forecasts and coverage of technology and price trends.